The ancient theater of Epidavros. ​In the peaceful land of Argolis, in an area with mild climate and abundant mineral springs, is the sanctuary of the god-physician Asclepios, the most famous healing center of the Greek and Roman world. The sanctuary belonged to the small coastal town of Epidavros, in the Peloponnese, today a half-hour drive from Nafplio and approximately two hours from Athens, but its fame and recognition quickly spread throughout the ancient Greek world. It is considered the birthplace of medicine and is thought to have had more than two hundred dependent spas in the eastern Mediterranean. Its monuments, true masterpieces of ancient Greek art, are a precious testimony to the practice of medicine in antiquity. They illustrate the development of medicine from the time when healing depended solely on the god until systematic description of cases and the gradual accumulation of knowledge and experience turned it into a science. It is evident that the area was devoted to the cult of healing deities since Prehistory. A Mycenaean sanctuary dedicated to a healing goddess stands on the Kynortion hill, northeast of the theater, founded in the 16th century BC over the remains of a settlement of the Early and Middle Bronze Age (2800-1800 BC), and functioned until the 11th c. BC. Unlike other sanctuaries of this period, it is unusually large. It was replaced circa 800 BC by another, dedicated to Apollo, a god with healing abilities, worshiped here as Apollo Maleatas. The worship of Asclepios, the sanctuary's main healing god, traditionally considered as the indigenous son of Apollo and Koronis, granddaughter of Malos, king of Epidavros, was established in the 6th century BC. Asclepios, protector of human health and personal happiness, was a very popular deity with an ever-increasing number of worshipers. The sanctuary at Kynortion was quickly overwhelmed by a great number of visitors, so a new sanctuary was founded in the plain, approximately one kilometer northwest of Kynortion Hill, on the site where, according to the myth, Asclepios was born. The two sanctuaries, one dedicated to Apollo Maleatas and the other to Asclepios, were subsequently known under the common name of 'Sanctuary of Apollo Maleatas and Asclepios'. A 1966 excursion of the Frantzeskakis family to the Theater of Epidavros. The buildings of the Sanctuary – temples, athletics facilities, the theater, baths, and so on – were built in an elevated valley surrounded by mountains. The Sanctuary was linked to the city by a road, large parts of which survive alongside the modern asphalt road leading to the site. As Epidavros developed, various athletic and artistic contests, including theatrical ones, were added to the worship of god Asclepios, through which systematic medical care was developed in antiquity. These contests at the Sanctuary formed an integral part of the activities conducted in honor of the god of medicine. Unlike other theaters of the Classical and Hellenistic periods, the theater at Epidavros was not modified during Roman times, and thus retained its original form throughout antiquity. ​The prevailing view among experts is that the theater was built in two distinct phases. The first dates to the 4th century BC, a period of significant construction activity at the Sanctuary. The second corresponds to the mid-2nd century BC. The original layout of the Epidavros Theater stage shows that it was intended for the performance of dramatic works at the level of the orchestra. During the second phase, actors would have performed on a raised proscenium, leaving the orchestra for the chorus. The theater is the best preserved monument of the Sanctuary of Asclepios at Epidavros. It has a perfectly executed tripartite structure characteristic of Hellenistic period theaters: auditorium, orchestra, and stage building (skene). The orchestra is perfectly circular (19.5 m in diameter), with a floor of beaten earth bounded by a ring stones at its perimeter. An open duct running around the outside of the orchestra collects and drains the rainwater that runs off the auditorium. 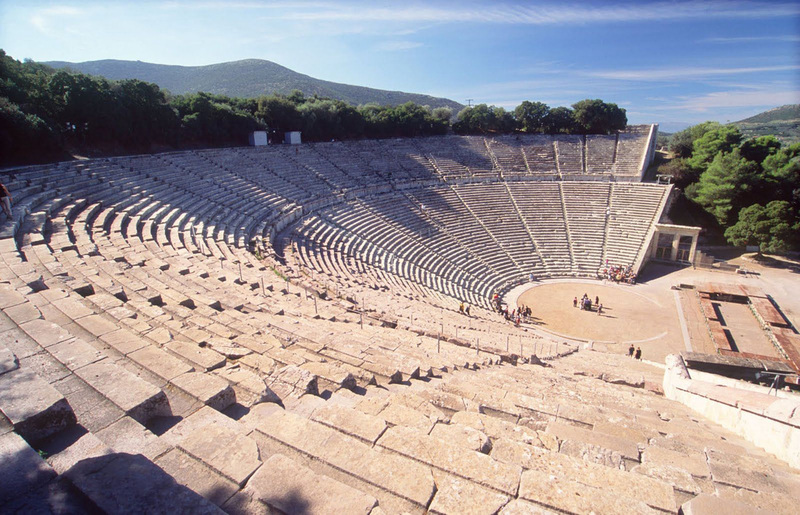 The Epidavros Ancient Theater owes its excellent acoustics to its geometrically perfect design. The Epidavros Ancient Theater. © The Archaeologist. ​​The auditorium itself nestles perfectly into the natural curve of the northern slope of Mt. Kynortio at an incline of about 26 degrees. It consists of two sections separated by a semi-circular aisle: the lower section has 34 rows of benches, and the upper tier, which was added during the second phase of construction, has a further 21. Narrow flights of steps divide the two sections into 12 wedge-shaped segments. The ground plan of the auditorium covers more than a semi-circle, and is slightly elliptical. There is a solid retaining wall at each end. The rows of benches in the eight central tiers were designed as circular curves centered upon the center point of the orchestra, while the pairs of tiers on either side form arcs centered upon a point beyond the center point of the orchestra. ​The theater seats around 14,000. The elongated stage-building adjoining the orchestra, closing it off end to end on its north side, consisted of two parts. At the front was the raised proscenium, with a façade in the Ionian order and projecting side-walls which faced the orchestra. At the back stood the two-floor stage building. The façade of the second floor bore wide openings, which would have housed painted backdrops. Two ramps, one on either side, led up to the level of the proscenium. Ionian pilasters flanking the two gates architecturally linked the stage to the retaining walls of the auditorium. The historian Pausanias visited the Epidavros Theater in the mid-2nd century AD, at least four centuries after the completion of the second phase of construction, and expressed his infinite admiration for its symmetry and beauty. Pausanias credits Polykleitos as the architect of this renowned theater, and for the circular tholos, dome or rotunda, at the Sanctuary. It is not clear whether this ancient traveler identifies the architect of these buildings with the great Argive 5th century BC sculptor of the same name (who was not alive at the time the theater was constructed), and the reference remains as yet unconfirmed by scholars. Epidaurus. Photograph courtesy Marietta Makri. ​The present form of the Epidavros Theater is the result of successive reconstruction and restoration works (by the site excavator P. Kavvadias, A. Orlandos, and the 1988 Committee for the Conservation of the Monuments of Epidavros Monuments – in progress). The theater was in continuous use for several centuries. However, in 395 AD the Goths invaded the Peloponnese and inflicted serious damage upon the Sanctuary of Asclepios. In 426 AD, Theodossios the Great gave orders banning all activities at the Sanctuary, which saw it fall permanently out of use after almost 1,000 years of operation. Natural forces and human interventions subsequently completed the devastation. While the auditorium was buried under a thin layer of soil and preserved, the ruins of the stage-buildings, which remained above ground, were systematically looted throughout the periods of Venetian and Turkish rule. ​In 1881, the Archaeological Society began methodical excavations at the site, and although the stage-building was no more, the auditorium was revealed to be in good condition, with only its retaining walls missing. The theater soon became famous once more, attracting the attention of the general public. The re-emergence of the well-preserved theater was closely linked to the revival of ancient drama. Pressing demands to put ancient theaters to cultural and commercial use led to a rushed and erroneous restoration of the auditorium. In 1907, the western aisle and retaining wall were repaired. ​​After the end of the WWI, calls for the revival of ancient drama gradually began to be realized: the Professional Theater School company was formed (1924); Angelos and Eva Palmer-Sikelianos organized the Delphic Festival for an international audience (1927, 1930); the National Theater was founded (1932); and systematic research was carried out into the staging of ancient theatrical works. In 1936, the Metaxas regime established annual festival seasons with performances of ancient drama in open-air theaters. Leading playwrights and musicians visited the Ancient Theater of Epidavros to stage one-off daytime musical and theatrical performances, experimenting with the site’s potential and exploring the extent to which their ideas could be implemented. In 1935, maestro Dimitris Mitropoulos gave a concert there with the Athens Conservatory Symphony Orchestra, while in 1938, Dimitris Rondiris and the National Theater presented Sophocles’ Electra, with Katina Paxinou in the title role and Eleni Papadaki as Clytemnestra. 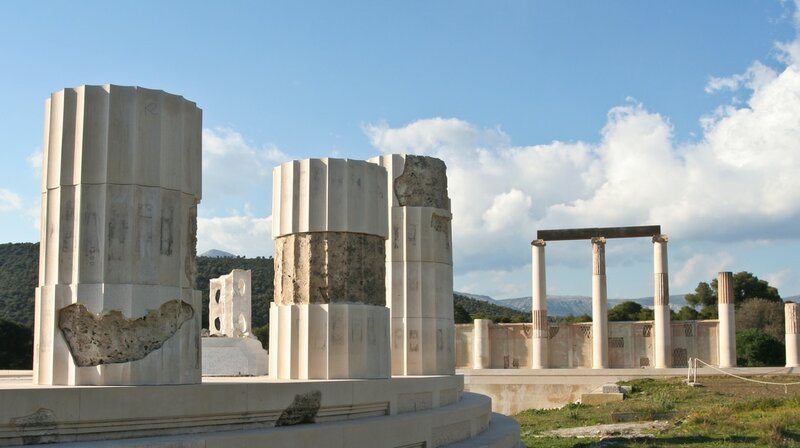 ​The second phase of works came immediately after the WWII, when the main aim was to shore up the monument and make it safe and suitable for summer performances of ancient drama as part of the Epidavros Festival. This entailed extensive excavation and restoration work by the Greek Education Ministry’s Department of Restoration. Conducted under the direction of Anastassios Orlandos, the work took almost a decade (1954-1963) to complete, and succeeded in ensuring the stability of all the seating in the lower tiers by completely rebuilding both of the retaining walls, and the pilaster on the east side of the entrance. Plans to repair part of the proscenium were never realized. ​The founding of the summer Athens and Epidavros Festival by the government of Konstantinos Karamanlis the elder in 1955 finally placed ancient drama firmly center stage. The long-held ideological fixation with modern Greece’s historical unbroken links to its ancient past at last found both comprehensive institutional expression and the ideal home. By the Summer of 1954, Rondiris and the National Theater were already experimenting with a reworked revival of his own, earlier production of Euripides’ Hippolytus. The Festival was officially opened on June 19, 1955 with a National Theater production of Euripides’ Hecuba directed by Minotis and with Paxinou in the lead role. By 1988, three decades of intensive and unregulated use necessitated a third phase of restoration work. This was undertaken by the Committee for the Conservation of the Monuments of Epidavros on behalf of the Ministry of Culture, and mainly consisted of corrective measures which employed strictly scientific approaches for the first time. 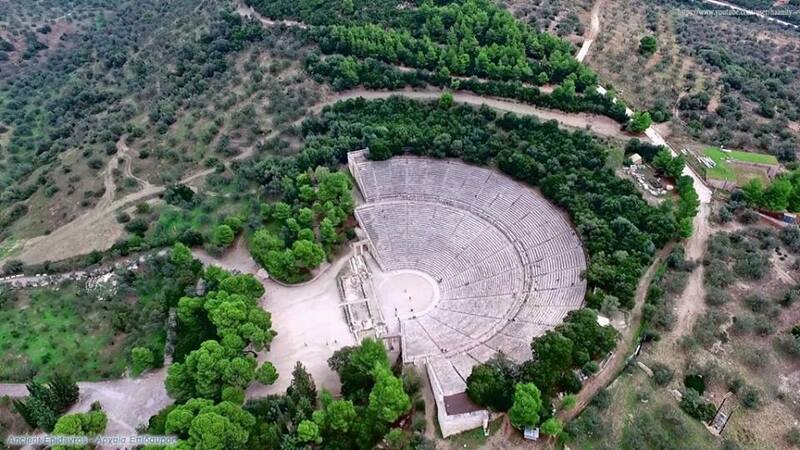 Over the 52 years of the Epidavros Festival, the stage of this renowned ancient theater has hosted all the leading lights of the post-war Greek theatrical arts; its scene has become the ultimate recognition of success for Greek actors, actresses, directors, composers, choreographers and stage designers alike. During the first two decades of the Epidavros Festival, the theater was reserved for the exclusive use of the National Theater of Greece. 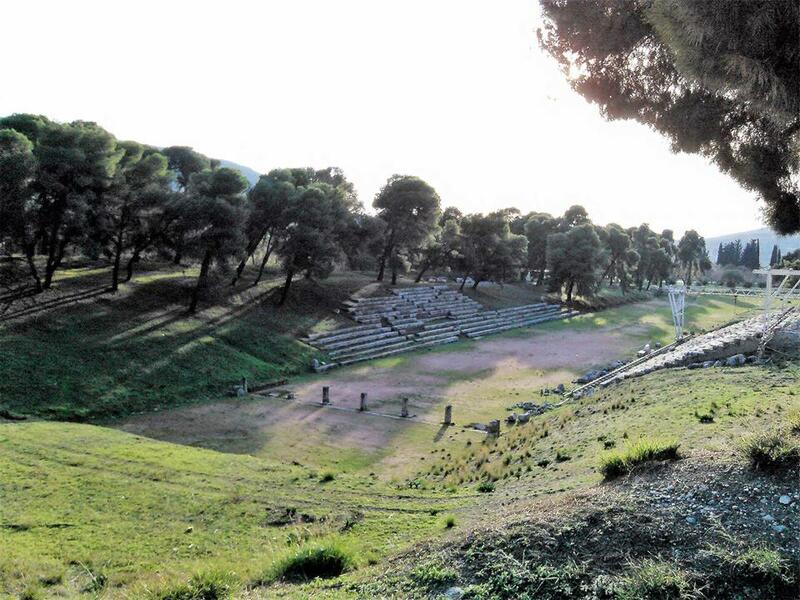 Apart from ancient drama, the Theater of Epidavros was also occasionally used for the performance of opera, dance, classical music, and other types of music. Among the best known of these events are undoubtedly the Greek National Opera productions of Bellini’s Norma (1960) and Cherubini’s Medea (1961) with La Divina Maria Callas, directed by actor Alexis Minotis and with costumes and stage sets by master painter Yannis Tsarouchis. Epidavros Theater (Upper Tier non-numbered seats) at an ancient Greek Drama or Comedy performance and Transportation by luxury air-conditioned coach. Performance starts at 21:00 and you will return back to Athens at around 02:00. The itinerary for 2018 will be available on a later date. 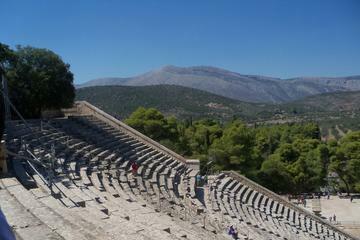 Day trip from Athens to Mycenae and Epidavros, from Viator. Explore the remains of the ancient city of Mycenae a major center of Greek civilization from 1600 BC to 1100 BC. 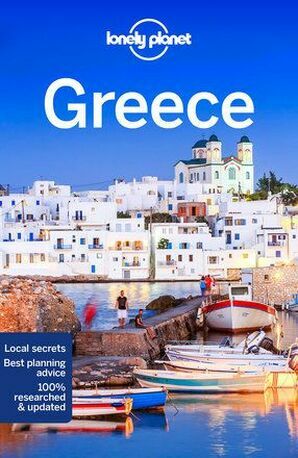 See the ancient ruins and the tomb of Agamemnon. 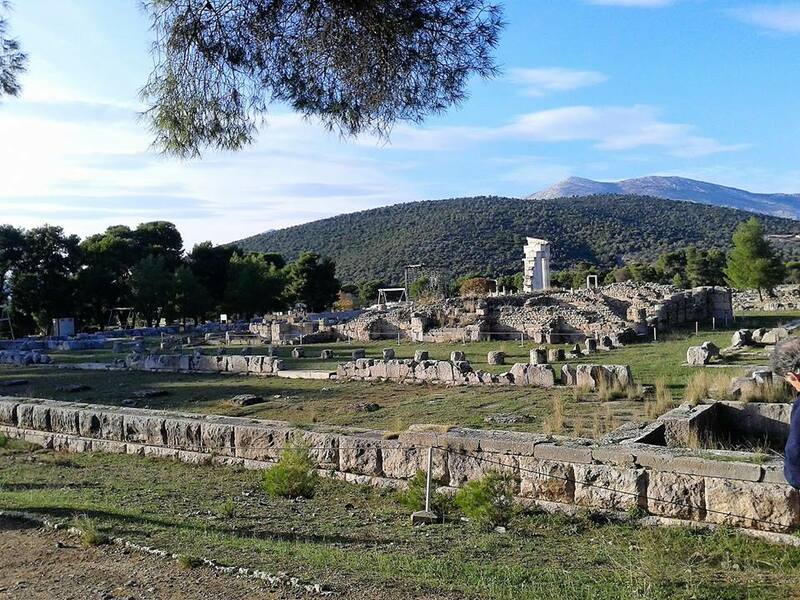 Then, visit the small village of Epidavros, birthplace of Apollo's son, an ancient sanctuary of healing and home of the most important theater of the ancient Greek world.